Gucci's 'Arli' bag is named after the historic French town of Arles, where the house's Resort '19 show was staged. Crafted in Italy from smooth burgundy leather, this vintage-inspired style is divided into two separate compartments and fitted with a zipped pocket and card slot so you can keep your essentials organized. Carry it by the handles or attach the shoulder strap to wear it cross-body. The double-G logo-inspired by a house design from the hallmark '70s era-furthers the retro-glam vibe of this gusseted handbag crafted from smooth leather. Style Name: Gucci Large Arli Leather Top Handle Bag. Style Number: 5742095. Available in stores. 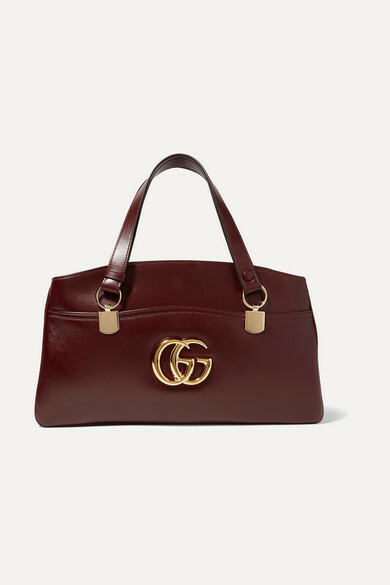 Gucci - Renewed from the 1970s archives, the Gucci Arli bag has a distinctly retro sensibility, modernised by twin handles that can be turned into a single shoulder strap. Smooth leather creates a blank canvas for the iconic double G logo -a striking statement in gleaming gold-tone hardware. Presented in the Cruise 2019 collection, this iteration was revealed at the Promenade des Alyscamps, an ancient Roman necropolis in the town of Arles, France, which gave its name to the line. Gucci smooth leather top handle bag with golden hardware.. Adjustable top shoulder straps with snap ends, 13" drop.. Dual recessed zip top compartments.. Exterior, interlocking GG at center.. Interior, contrast fabric lining.. One zip pocket; card slots.. 7.5"H x 14.5"W x 3.5"D.. Made in Italy. Brought back from the 1970s archives, the Double G hardware defines a new line of handbags. The oversize emblem decorates the front of a leather tote, designed with a vintage feel. The accessory was presented in the Cruise 2019 collection, revealed in the evocative setting of the Promenade des Alyscamps, an ancient Roman necropolis in the town of Arles, France. Burgundy leather. Viscose lining. Gold-toned Double G metal hardware. Two gussets. Front and back open pockets. Interior zip and smartphone pockets. Adjustable straps with snap button allow this bag to also be carried as a shoulder bag. Strap drop 14cm when worn as a top handle bag; 33cm when carried as a shoulder bag. W37cm x H19.5cm x D8.5cm. Made in Italy. Brought back from the 1970s archives, the Double G hardware defines a new line of handbags. The oversize emblem decorates the front of a leather tote, designed with a vintage feel. The accessory was presented in the Cruise 2019 collection, revealed in the evocative setting of the Promenade des Alyscamps, an ancient Roman necropolis in the town of Arles, France—which gives the name to the line.